Definition of failure in Dayton on election day. If the map is this divided after the election tomorrow, we’ve seen no progress in Dayton. 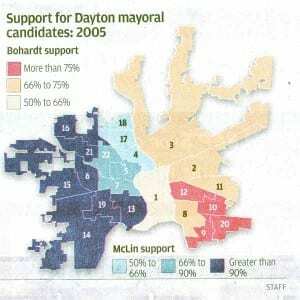 In the Bohardt/McLin race in 2005 the city split. Please, get out and vote- for the people you believe will make an attempt to represent the entire city- and bring us together. It’s not a black or white thing, Democrat or Republican. It’s about vision and a plan. Hopefully- voters will see through all the hype. Previous Post: Politics as unusual. My personal goal. Next Post: Hey NYC, LA, want to see why Dayton is great! Esrati, so much for your integrity. You (or your folks) went around to polling locations and kicked over Whaley and McLin signs that were in the vicinity and replaced them with your sign. So much for openness and promoting an informed electorate. Are these the “new ideas” that we can expect? The most disappointing thing for me was that you put up your signs and not Gary’s. Gary handed out your literature and helped you throughout the campaign. So much for being a team player. It proves that you only look after yourself. Blah, blah, blah…That has nothing to do with writing legislation. Didn’t David and Gary have different viewpoints on yard signs? David took the view that yard signs shouldn’t be placed on public property but rather should be only on private property owned by people who wanted his yard signs. Gary seemed to have taken the traditional view that the more signs out there, the better, including on public property. Would it have been better for David to have violated the integrity you just praised and instead been a team player putting out yard signs where he’d said they shouldn’t be? David did take plenty of opportunity here on this site to endorse Gary for mayor and to urge people to vote for the both of them. I did no such thing. Never touched another candidates sign. Who ever put them up- did a crappy job-or they bought cheap steel- and it bent with the wind. Police saw me as well. As to putting out Gary signs- he has none to put out- or I would have. And- for the record- all of my signs until last night were on private property with permission. The last push was at polling places only by me. I do know some of my supporters put some in public right of ways at the last minute. Before you make accusations- you better have your facts straight. I have no interest in kicking down any ones sign. Find a single foot print on them- my feet were covered with green chalk and mud last night. Speaking of division, Gary has a posting on his blogspot saying that the Democrats send out another postcard, but this time only to residents of the west side of town, with the “rascists” comments that they have on the no-gary website. David wouldn’t do that, if anything, he does have integrity. Now, about the city being divided, I am predicting much of the same as it relates to voting habits and neighborhoods. The west side will support McClin, Williams and Waley. The East side will support Esrati and Gary, it is what it is, I don’t think it is a measuring stick to how far we have come in bridging the great divide. I have however heard more west siders complaining about McClin than ever before. The next election, McClin will lose for sure, or she won’t run again, so I guess there is always that to look forward to. Not sure what exactly they are trying to say about race, Gary won because he’s white? He won because he *didn’t* exploit race? He won because … and the DDN waves its hands about economic troubles being rough on incumbents. We got one of those red “Gary is a racist” post-cards at our house here in Grafton Hill. I’m glad the Dayton electorate has sent the message that these low-road smears are not effective, people are tired of being manipulated by the demagogues and power brokers. @jstults I’d still like to get a scan of one of those “racist postcards” if you have it. The editorial board is made up of idiots. Their backhanded endorsements and pronouncements are as worthwhile as an additional boat anchor on a sinking ship. Gary won because he didn’t get in the mud- and he hadn’t done nothing for 8 years. Based on the graphics the DDN has posted the map did look a lot like the Bonhart/McLin match-up in terms of what areas voted for who (though I’d like to see more detail on the majority-vote margins). The big difference, as has been reported, was the turnout. McLin was not able to turn out her base, who didn’t vote for Leitzell either, but stayed home instead. So not necessarily a big “yes” for Leitzell except for the usual wards and precincts that vote for white/GOP candidates (Belmont, Patterson Park, Forest Ridge, etc), but more a rejection of McLin by former McLin voters, who “went fishing”, as they say in politics. Alas- side by side, the maps don’t look much different. I might try to put together one for the commission race. I think I had a little more broad based support. Was just gonna post about the map for this year’s election… No need to now. But, look at the top picture, the one labeled “turnout”. Northeast Dayton, or Huber Heights, where many, many city employees live, had a greater than 37% turnout. Only the most southeastern part of Dayton had a similar turnout. The Dayton Daily News posted some neat data on the election by ward. It seems that not only did McLin base not turn out (off 20% on average compared to the McLin/Bohardt election, up to over 30% in two wards), but of the voters who did turn out, McLins margin dropped. The worst was Ward 13, which is the College Hill and Greenwich Village area. McLin won by 95.5% in 2005, but got only 86.6% in 2008, a decline of 8.9% points. This ward had McLins biggest % drop, citywide. McLin’s margin declined by 3.85% on average in her wards. So it wasn’t only low turnout, but also a small shift to Leitzell, too. Interestingly, in the “swing wards” along North Main and around downtown, McLin very slightly improved her margin over 2005. So Leitzell did make some inroads into the black vote this election, compared to Bohardt. I looked at my data- compared it to the Leitzell voters- and across to the Joey/Nan voters. I rarely matched Leitzell- probably from lack of TV debate or any TV coverage at all. The vote swing between the three commission candidates- pretty much swung along race- except in the two precincts that know me best- my own- 1 and the cop/firefighter haven 3. I didn’t have a ton of time to look- but, my time spent knocking on doors on the west side and calling most likely voters gave very little return. I’ll get the entire voter database and see how many of the “super voters” we lost- or where we picked up new ones- and figure it all in- eventually.